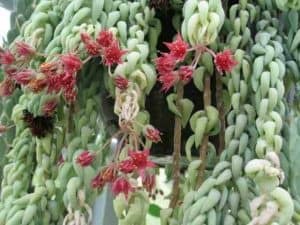 This lovely trailing succulent is the quintessential hanging basket plant, but it has other uses too! Or burrito, or horses tail, or donkey tail, or anything really. As far as common names go, this plant is loaded with them. The plant is similarly thick with tightly packed, short leaves. These leaves are quite tenuously connected to the plant and often fall off at the gentlest touch. You don’t need to worry about hurting the plant this way, but it might be less aesthetic if it has patchy foliage. Morganianum can be found in a variety of colors: anything from a vivid blue-green, to regular green, even gray. They leaves often appear with a very light dusting of a white, chalky powder. If you care well for your morganianum, it can one day grow to have tendrils up to 4 feet long! With that in mind, use a sturdy, well-anchored hanger if you plan on keeping it suspended. As you can imagine, it will get pretty heavy. 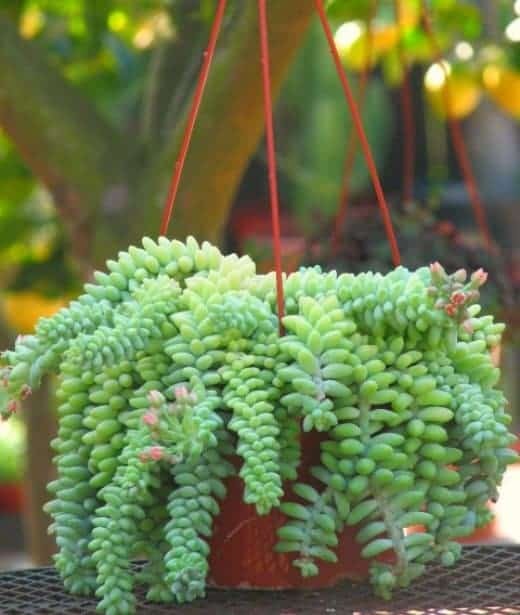 Compared to other succulents, this Sedum is an excellent and safe houseplant. 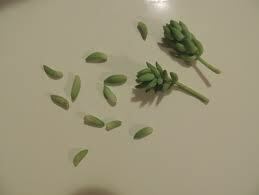 It is non-toxic to children and pets alike and even lacks the spines of many other succulents. If you do keep it inside, make sure it is in a place with lots of sunlight. Growth will be severely impaired if it does not receive full sunlight. Ever the versatile plant, morganianum looks great both solo and in arrangements. When alone, it fills up a pot or basket nicely and eventually trails over the side with characteristic flourish. Even amongst other plants, morganiuanum doesn’t mind sharing! It doesn’t need a lot of personal space, and can do most or all of its growth outside the container! the roots because the soil retains water too well. Once you’ve got the soil sorted out, you need to make sure you are watering appropriately. Give it a healthy drink every 1-2 weeks depending on the heat and dryness of your region (or house). During the winter, slow it down to about once every 3-4 weeks. They don’t grow a lot during that time, so they need less water. It’s important that these plants get sufficient sunlight! 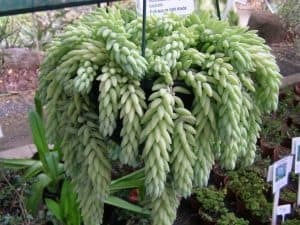 Although they are great houseplants, morganianum need more sunlight than your average indoor succulent to maintain growth. They absolutely need to be in a window (or between a couple!) or have supplemental light like a grow lamp. You don’t want to stunt the growth of your luscious succulents! Like many succulents, morganianum can be propagated via leaf cuttings. Due to the tendency with which this plant drops leaves, you might find yourself making more propagations than you expected, but that’s never a bad thing! Give the extras to your friends! 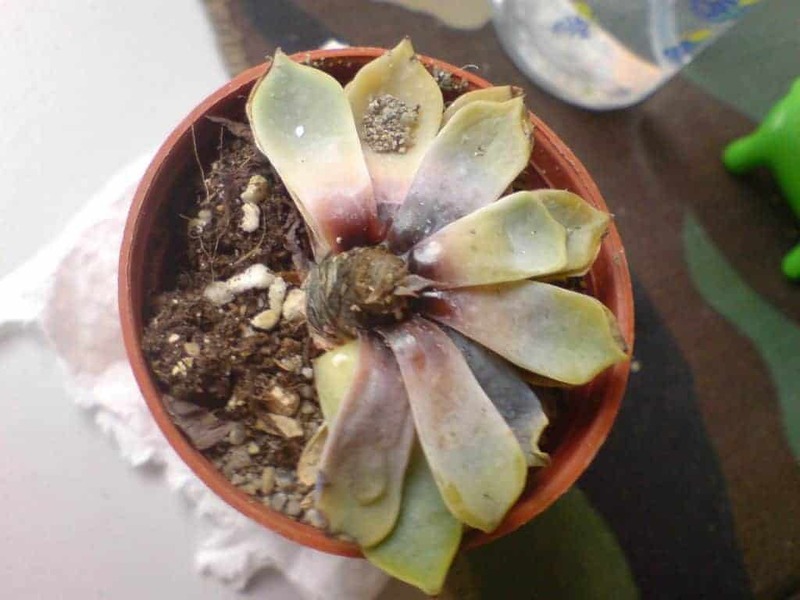 You can follow this guide on general propagation for more information, but simply placing fallen or plucked leaves on soil for a a few days, then keeping them damp will net you some new succulents in no time! Likewise, you can propagate via stems too (which is a bit quicker). Cut off a desirable length of your plant, then strip the leaves a couple of inches from the bottom. Let the cutting dry in sunlight for a week or so until it calluses, then go ahead and plant it! Do you have any awesome arrangements of Sedum morganianum? Show us your succulents! Those little guys are pretty flexible. Full sun or indirect sunlight will both be fine!